Every high school football team has a Company of the Ages. You see that “Company” every Friday night in the Fall on the sidelines. Have you ever been to an Arcadia game on a Friday night in late October? Let’s just say it’s hard to navigate your way from one twenty yard line to the other. That “Company” is the alumni – the former quarterback who reminisces about the touchdown pass he threw to clinch the league title or still grimaces over the one he missed. It’s the running back who recalls the time he trucked the safety on his way to the end zone on a cold November night a decade earlier and the right guard who threw the key block to spring him. It’s the former players that want their team to succeed so badly that a loss still feels like a kick in the gut, and a win is still worn like a badge of honor. It could have been Arcadia or San Dimas but Joe Torosian depicted Temple City. When it comes to football Temple City was once so revered around town that criticism of its team was tantamount to talking bad about one’s mother. When Bob Hitchcock roamed the sidelines back in the seventies CIF titles were as common as the annual Camellia Festival at Temple City Park. It’s a small town feel with big town pride – especially when it comes to football. It has a uniqueness that separates itself from neighboring cities. Torosian was able to create that feeling and bring it into modern day through the eyes and ears of “The Company”. The story and the Rams game with Arcadia is fictitious but it was taken from real life scenarios. It is exactly the way things could have played out. Torosian, having spent countless Friday nights on the sidelines over the last two decades, uses his knowledge and experiences and that of former players to make this work. The book puts you in the conversation with the “Company” and gives you the idea that you’re standing right next to them and sharing a laugh, a memory or a even a play as you look out on the field. When I was a colleague with Joe at Mid Valley Sports, (he has since moved on to bigger and better things) he used to tell the rookies to never cover a high school football game from the stands or the press box. In fact if he heard one of the newbies come back and say they sat in the press box he became irritated. “What stuff?” the first year stringer would ask. Torosian, sometimes with the help from some of us experienced game story writers, would explain that the “stuff” was a lot of things. It was the pain on the face of a player that just missed a tackle, it was the coaches barking out plays and defensive alignments or admonishing (to sugar coat it) a player for botching an assignment. It was the interaction between coaches and officials, it was the joy that reverberated on the sidelines after a big play. The “stuff” was everything- it was high school football. He explained to the kid that may have been still a little wet behind the ears that by covering from the sidelines you gain the full experience of high school football and you don’t want to miss that. Torosian captures the “stuff” in this book. He captures it through the coaches, the parents and the fans. And of course he captures it in “The Company”. Get ready to spend some time on the sidelines, get in on the “stuff”, and enjoy “Temple City & The Company of the Ages”. 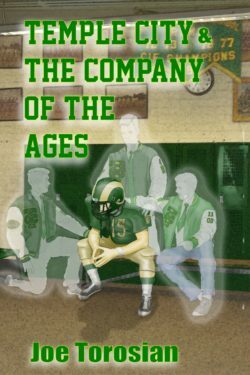 4 Comments to "Temple City & The Company Of The Ages Now Available"
Some of us “baby-boomers” happen to like football at all levels…. Maybe we need to find out whether there’s any actual polling data concerning football’s approval rating among baby-boomers, Generation-Xers, and millennials. Millennials and post-millennials are the ones currently playing the game, by the way. At a time when a noisy contingent of baby-boomers are throwing daggers at high school football, Joe stands as an oasis of respect for what the game means to those who play and those who watch.